Lofts on the Alameda is located at the edge of downtown San Jose near shops and dining, and walking distance to the HP Pavilion. These downtown lofts come with the amenities that anyone would be looking for including private patios/balconies. They also include granite counter tops, stainless steel appliances, and amazing floor to ceiling windows. When first built there were three plans to choose from. 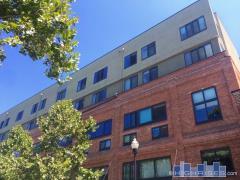 The Lofts on the Alameda exemplify true urban living. Have any comments or questions about Lofts on the Alameda? Ask your question and/or share your thoughts about this Building.